Prepare your favorite brownies in a 9-inch x 13-inch pan, according to the package directions. You can add a handful of chocolate chips for good measure, if desired. Let cool. To make the frosting, using an electric mixer, combine the butter and sugar until smooth. Add the milk until the frosting reaches the desired consistency. Add the mint extract and food coloring (add as many drops as you need to make it the shade green you want). Mix until thoroughly combined. Frost the cooled brownies. To make the drizzle, melt the chocolate chips with 1 tablespoon of butter in the microwave in 30 second increments, stirring each time, until smooth. Be careful not to burn the mixture. Add the additional butter and stir until it is a drizzle consistency. Add the vanilla and stir. Drizzle the chocolate over the frosting in a zig-zag pattern. Cool or chill in the refridgerator until set, then cut into squares. In Recipes-list.com we have selected the most viewed recipes from category - uncategorized . Enjoy the best recipes specially selected for you! 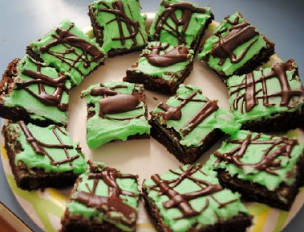 Aunt Missy’s Mint Brownies is the right choice that will satisfy all your claims.